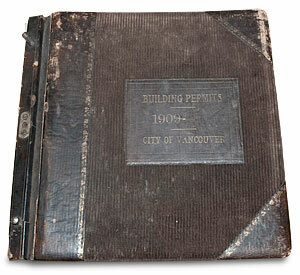 Over 50,000 pre-1929 historic Vancouver, BC building permits, transcribed from original hand-written ledgers into a searchable online database, created and sponsored by Heritage Vancouver Society. The data transcribed within this database is not a contemporary listing of all Vancouver's historic properties, but instead an exact transcription of original, historic building permits dating from 1901 to the early 1920s, from the three pre-1929 historic municipalities of South Vancouver, Point Grey, and Vancouver. Depending on how the original entries were entered 100-years ago, permits could be incomplete, erroniously entered, streets/address changed, etc., it might take some sleuthing to dig out the information, along with additional resources (see resources). The Heritage Vancouver Society has sponsored this building permits database as a community service to assist individuals with historical research pertaining to the City of Vancouver. Beginning in 2009, we began to prepare the data to serve as the basis for an online searchable database available to the public, launched online in November 2011. This entailed manually comparing every originally transcribed data with the original books, ensuring the data and spelling is accurate, and subsequently filling in any missing information and/or additional data. To date (May 2018), this has involved the transcription of over 50,000 individual line entries/permits. Transcription of hand-written permit entries (1901-1914/1918). Initial data made publicly available on a limited basis. Transcription of Point Grey permits 1918 to 1923 DONE! Transcription of South Vancouver permits 1912 to 1921 DONE! Transcription of Vancouver permits 1916 to 1920 DONE! Building and launch of an online searchable database DONE! Municipality of South Vancouver 1923-28 DONE! Municipality of Point Grey 1927-28 DONE! The primary sources for these records are the original building permit registers stored at the City of Vancouver Archives. The registers consist of applications to construct, move or improve existing buildings. Prior to 1912, City of Vancouver descriptions of the work included whether the building was frame or brick, and the type of building (e.g., dwelling, shed, store). Each application is listed as a one-line entry, and organized according to the owner’s last name, loosely alphabetized within each year (e.g., for the year 1901, all last names beginning with ‘A’ are grouped in chronological order). Later registers are chronological, making manual searches for individual properties very difficult. The database follows a format similar to that of the corresponding original registers. Where applicable, the database provides information on the owner, architect, builder, month and year of application, legal description (more location accurate), street number and name, building cost, permit number and remarks regarding the type of building or nature of the work. Unfortunately the original permit book(s) for the years 1905 to 1908 for the City of Vancouver are missing, and have been for decades, and were never available for microfilming/copying so the data for this span is unavailable (see next paragraph). For 1905 and 1906 data, we have transcribed basic building permit data which was published in the January 1906 and 1907 issues of The Province newspaper — the info consisting only of the applicant's name, project cost, basic description, and sometime the street name. We've also located permit data from an additional source for 1907 and 1908, which is now transcribed, and is being checked. This data will be incorporated into the online database in late-2018. Using the above materials as a basis for permits, we've been adding in additional details (street number, architects when known, legal descriptions, etc.). The early permit registers are handwritten in the distinctive cursive script of the era, in varying degrees of legibility. There were also many variations in spelling. This presents a number of challenges in the transcription. Wherever possible, names that could not be deciphered were confirmed against directories or BC Vital Events, City Directories, and even Water Permit applicaitons. The transcription process has undoubtedly resulted in errors in interpretation. There's a feedback mechanism as part of the searchable database to ensure that errors can be reported and corrected on an ongoing basis, with any additional contemporary data appearing in [squared brackets]. Please note that neither the Heritage Vancouver Society nor the City of Vancouver Archives assumes responsibility for the accuracy or comprehensiveness of this database. The Heritage Vancouver Society strongly encourages users who wish to verify individual entries to consult the records located at the Archives, many of which have been microfilmed. Manual transcription takes time and a lot of hands, espcially when working from a handwritten source. If you're interested volunteering with data entry for this invaluable project, please let us know. You'd be working on your own time from both digital images of the actual entry pages, along with hard copies, and entering the raw data in a basic Excel template or an online Google docs spreadsheet. The Heritage Vancouver Society could not have begun this project in 1997 without the generous assistance of the B.C. Heritage Trust, the Real Estate Foundation, the Canadian Art Deco Society and the City of Vancouver Archives. In addition, Robert J. R. Faulkner offered valuable guidance, based on his experiences compiling a similar index for the City & District of North Vancouver. The City of Vancouver Archives staff have provided invaluable assistance throughout this project. The original transcription work was undertaken by Leah Holman with assistance from Nancy Byrtus from 1996 to 1998. The 2009-ongoing team has been actively engaged in checking the existing data, and transcribing additional data from the original hand-written entries.